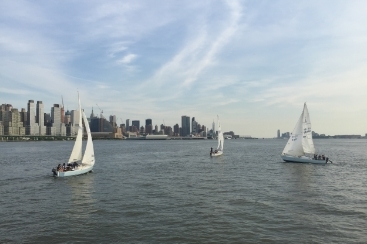 At Atlantic Yachting's NYC Sailing Camp, students learn teamwork, planning and responsibility in an exciting and challenging atmosphere, while at the same time discovering one of the world's oldest and most rewarding sports. 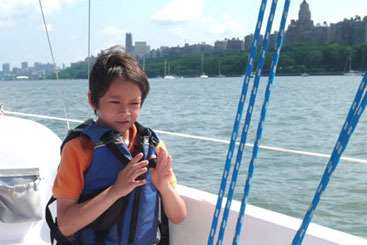 Kids ages 9-15 learn to trim sails, tie knots and man the helm aboard modern sailboats. Our sailing curriculum, combined with our team and self esteem building activities, help young sailors to build confidence, bolster self-reliance, and fulfill their inner potential – and have tons of fun while doing it! Beginner to advanced sailors welcome. All instructors min. ASA Certified & USCG Master Capt. Supervised. Our camp operates Monday through Friday from 9am to 3:30pm out of our two locations: the 79th Street Boat Basin on the Upper West Side of Manhattan, and Pier 25 in Tribeca. It is designed as a two-week program but campers may join for as little as one week or as much as the whole season. Our 6:1 child/instructor ratio allows kids to learn quickly with hands-on involvement in every aspect of the boat. Our counselors are ASA Certified Instructors and life long sailors who have extensive experience working with young sailors. We believe in hands on learning, which means that kids captain the boat, trim the sails, and do the navigating starting the minute they leave the dock on the first morning. By the end of the program, we will have covered the fundamentals of sailing and your camper will have a comprehensive idea of everything from knot tying to points of sail. The program has been designed to accommodate all levels - new sailors develop skills rapidly and experienced sailors flourish. Fun is at the forefront of our program. We allow New York City kids access to the wonderful and thrilling world of sailing in an enjoyable and relaxed atmosphere. We understand that the happier the camper, the more open mind he or she will have about sailing and the better sailor they will become. Safety is our highest priority. While we want our participants to experience the thrill of sailing, we employ the utmost vigilance and expertise to keep them safe in the process. Activities are carefully planned and overseen. Our vessels are manned by experienced instructors who are licensed by the American Sailing Association and trained in First Aid and CPR. Our program directors are US Coast Guard Masters level licensed captains. Children wear lifejackets at all times when on the dock or on boats. In the event emergency medical attention is required, our launches give quick access to shore-based emergency personnel. The Atlantic Yachting fleet is always within range of radio and telephone contact of emergency services and also has a direct connection to the United States Coast Guard. We have a perfect safety record and use all available means to keep your child safe and happy on the water.